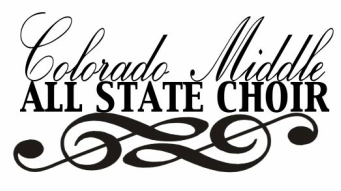 Colorado Middle All State Choir offers 7th and 8th grade students in Colorado a chance to audition for one of our three elite ensembles: Treblo, Mescolare, and Cambiato. Designed to be a transition between the Elementary and High School All State models, CMASC requires students to audition with a prepared piece, as well as demonstrate their technical skills, but ensures students from all CMEA Districts have representation at the event. The two-day event is held at the Colorado Convention Center, where students have the opportunity to sing with 150 other talented, motivated, and dedicated singers, as well as learn from elite clinicians from around the country. Additionally, the participants will interact with High School All State students and experience a performance by local elite ensembles. The culminating concert is held on the final evening in the 5,000 seat Bellco Theatre, and is open to the public. Monday, September 16th - Official Audition Materials posted. Audition Material passwords will be sent to Directors by District Governors. Friday, October 4 - Audition Submission Deadline. ALL AUDITIONS, PAPERWORK, AND FEES DUE BY 5 PM! Monday, November 25 - Acceptance Announcements! Selected students' names will be sent to their choral director via email. Directly after acceptance - Directors order music for students.